Much to my chagrin, Fall is here. There is nothing I can do about it except embrace it and let the waterfall of orange/brown/yellow-themed foods wash over me. This week's Sunday Supper theme is Fall foods. Since I am treading into this post begrudgingly, please be mindful that your heart-felt declarations about Fall being the best season ever will not sway me. They will piss me off. The only redeeming quality about this post is the surprise of LATE SUMMER (my favorite season!) figs. 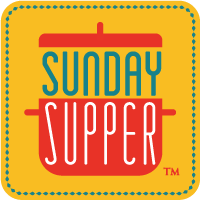 And the fact that Sunday Supper's mission is to bring back Sunday Supper Around the Family Table in every home. And Sunday is the only day of the week I cook (at home). 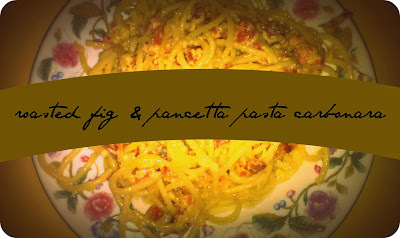 This week, it's roasted fig & pancetta pasta carbonara. The sweetness of the figs intensify when baked and the lemon zest, a last look to the bright, sunny season of summer. The thyme and rosemary dance lightly along with the lemon and remind me of the dark, dank Fall days ahead. When the figs are added to the hot pasta and smoky, salty pancetta, it's the perfect union of summer and fall. Toss the figs in a large baking dish with the thyme, rosemary and lemon zest. Turn the figs cut side down in the baking dish, in a single layer. Cover the baking dish with foil and bake for 15 to 20 minutes, or until the figs are softened and cooked through. When cooked, remove the baking dish from oven, lift off the foil, and let the figs cool completely before chopping up to put into the carbonara. Bring a large pot of salted water to a boil, add the pasta and cook for 8 to 10 minutes or until tender yet firm (al dente) Drain the pasta well. While the pasta is cooking, heat olive oil in a deep skillet over medium flame. Add the pancetta or bacon and saute for about 3 minutes, until the meat is crisp and the fat is rendered. Toss the garlic into the fat and saute just until the garlic softens. Beat the eggs and Parmesan together in a mixing bowl, stirring well to prevent lumps. Set aside. Add the hot, well-drained spaghetti to the pan with the bacon drippings and toss with tongs to coat the strands in the fat. Remove the pan from the heat and pour the egg and Parmesan mixture into the pasta, whisking and tossing quickly until the eggs thicken, but do not scramble (that is why the pan is taken off the heat). Add the chopped roasted figs to the pasta and toss once more. 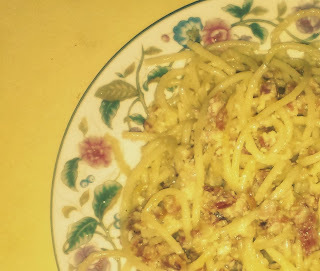 Season the newly formed carbonara with black pepper and taste to add salt. Serve. It's hard to transition here it Florida to fall sometimes...still in the 90's. But, this is an awesome way to transition. Love the figs! I am with you on the joys of summer but since we moved to Dubai, I've got to say that I would welcome a little relief from the sweltering heat. I love baked figs with blue cheese so I am imagining the saltiness of the pancetta would be just as divine. ROFL!!! You are so funny! YES it is Autumn - and I LOVE IT!!! But I would love it more if I was still in Alaska. Autumn is a joke in Alabama. I get the weather/heat thing. When I didn't live in St. Louis, I missed my 4 seasons. Florida was the worst, because to us it felt like one long season for 365 days. LOL Christmas was always weird. anyway, this looks fabulous Nik and I love the addition of figs which I have been totally into lately. yum! I am very against fall too! Although rather than deciding to take it in stride, I complain about it at every opportunity and talk about how I want to move to CA. I'll be even more fun during winter ;) I love figs too! So great to use them in a savory dish! Your feelings about fall reflect my feelings for summer. I dread the stifling blanket of hot, humid air that hangs over me during June, July, August. The only time I loved summer was when we lived in San Francisco...chilly and cool. The figs sound like the perfect complement to the salty and creamy carbonara. Yum, yum, yum. This recipe looks absolutely amazing! Love the combo of pancetta and figs! What a terrific twist on a classic dish I adore! Perfect for autumn! You know, I've never had fresh figs before, but I do love carbonara. If I can get a hold of some figs, I'd be happy to try this dish first! I like fall for the colours but hate it for the chill! Totally agree with you on the awesomeness of figs though! Never added them to pasta but maybe it's time to start! Your pasta looks amazing! This would be a sure hit with my family!! Perfect comfort food! Embrace Fall, Nikki! Ahh don't beat me! haha ;) Aside from all of the Fall season love, I do love this Carbonara! This pasta looks amazing! I never thought about putting figs in pasta, but it looks great. I really like all of the fall themed foods you posted too, can't wait to try them. The apple spice muffins and the mini apple cinnamon rolls sound delightful. Such an interesting flavor combo, but it sounds delicious! I love the idea of using figs! This sounds wonderful--I love the sweet/salty combo, and what a great way to use figs!